An announcement (it’s in German, I’m afraid) proudly declaring that ‘homeopathy fulfils the criteria of evidence-based medicine‘ caught my attention. In 2016, Dr. Melanie Wölk, did a ‘Master of Science’* at the ‘Donau University’ in Krems, Austria investigating the question whether homeopathy follows the rules of evidence-based medicine (EBM). She arrived at the conclusion that YES, IT DOES! This pleased the leading Austrian manufacturer of homeopathics (Dr Peithner) so much and so durably that, on 23 March 2018, he gave her a ‘scientific’ award (the annual Peithner award) for her ‘research’. Her paper is unpublished, or at least not available on Medline; therefore, I am unable to evaluate it directly. All I know about it from the announcement is that she did her ‘research at the ‘Zentrum für Traditionelle Chinesische Medizin und Komplementärmedizin‘ of the said university. A quick Medline search revealed that this unit has never published anything, not a single paper, it seems! Disappointed I search for Dr. Christine Schauhuber, the leader of the unit; and again I find no Medline-listed publications in her name. My interim conclusion is thus that this institution might not be at the cutting edge of science. But what do we know about Dr. Melanie Wölk’s award-winning master thesis *? On that basis, she arrived at her positive verdict – not just tentatively, but without doubt (“Das Ergebnis steht fest”). 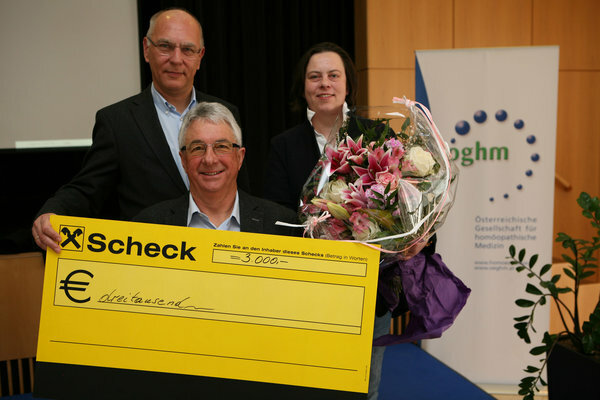 I do hope that Dr Wölk uses the prize money (by no means a fortune; see photo) to buy some time for publishing her work (one of my teachers, all those years ago, used to say ‘unpublished research is no research’) so that we can all benefit from it. Until it becomes available, I should perhaps mention that the description of her methodology (publications between 2010 and 2016 [plus a few other papers that nicely fitted the arguments? ]; including one Linde review and not his more recent re-analysis [see above]) does not inspire me to think that Dr Wölk’s research was anywhere near rigorous, systematic or complete. In the same vein, I am tempted to point out that the Swiss report is probably the very last document I would select, if I wanted to generate an objective picture about the value of homeopathy. pseudo-medicine (a treatment that has been tested extensively but has not been shown to work beyond placebo). *Wölk, Melanie: Eminenz oder Evidenz: Die Homöopathie auf dem Prüfstand der Evidence based Medicine. Masterarbeit zur Erlangung des akademischen Abschlusses Master of Science im Universitätslehrgang Natural Medicine. Donau-Universität Krems, Department für Gesundheitswissenschaften und Biomedizin. Krems, Mai 2016. Reiki is a Japanese technique administered by “laying on hands” and is based on the idea that an unseen “life force energy” flows through us and is what causes us to be alive. If one’s “life force energy” is low, then we are more likely to get sick or feel stress, and if it is high, we are more capable of being happy and healthy (because it is such a clear-cut case of nonsense, we have discussed Reiki regularly; see for instance here, here, here, here, here, here, and here). But nonsense does not stop researchers from conducting trials. In this new clinical trial, conducted in Physiotherapy Clinic of Khatam Al-Anbia Hospital in Iran, 60 patients with pain due to inter-vertebral disc herniation (IVDH) were randomly assigned to one of three groups. The Reiki group received three 15-minute Reiki sessions on consecutive days by a master of Reiki plus Indomethacin and Methocarbamol (as in group 3). The physiotherapy group underwent 7 to 10 sessions of physiotherapy of 60 to 90 minutes (heat therapy, TENS, pelvic traction, and physical exercises) plus Indomethacin and Methocarbamol (as in group 3). The drug group received Indomethacin capsules 75 mg and Methocarbamol tablets 500 mg every 8 hours daily for one week. The severity of pain and the activities of daily living (ADL) were measured using visual analogue scales (VAS) and ADL-Instrumental ADL questionnaire before and after the intervention. A significant difference was found in pain intensity and ADL improvement between Reiki and the drug therapy. No significant difference between the Reiki and physiotherapy groups were noted. The authors concluded that Reiki and physiotherapy are effective methods in managing pain and improving ADL in patients with IVDH; however, Reiki is more cost-effective and faster treatment method than physiotherapy. This RCT seems fairly well-panned and conducted, and its results are straight forward. My only problem with it is how the findings are interpreted. The study design was such that there was no blinding or control for placebo effects. Therefore, the observed outcomes can be interpreted in more than one way. In my view, by far the most plausible explanation is that Reiki (being an exotic, impressive intervention that generates plenty of expectation) produced a powerful placebo effect. Physiotherapy (being entirely normal and routine), on the other hand, was only marginally successful. It is regrettable that the authors do not even consider this interpretation of their results. They should have remembered that a clinical trial test the null-hypothesis (the experimental treatment is not better that the comparator) which can be rejected only, if there is no other reasonable explanation for the results produced. The addition of Reiki to drug treatment generated better outcomes than drug therapy alone. Physiotherapy was only marginally effective. The effects of Reiki are most likely not due to the treatment per se but to a classical placebo response. Chiropractic for kids? Yes, many chiropractors advocate (and earn good money with) it, yet it has been pointed out ad nauseam that the claim of being able of treating paediatric conditions is bogus (in fact, the BCA even lost a famous court case over this issue). But evidence does rarely seem to stop a chiro on a mission! This website shows us how UK chiropractors plan to educate colleagues in ‘paediatric chiropractic’. The seminar offers a neurological approach to healthy development in babies & children. It provides clinically relevant assessment, adjusting & clinical decision making. The focus will be on a Chiropractic wellness paradigm with a collaborative approach to promote healthy outcomes across the infant to adolescent years. This is a hands-on program with a focus on neuro – developmentally appropriate adjusting of the spine and cranial dural system for health. We address some of the leading challenges with infant health and development, and teach exciting home care plans to facilitate optimum development. Genevieve & Rosemary Keating are leaders in Chiropractic paediatric health, learning & development. Both are experienced Chiropractors, Facilitators, Diplomates of the American Chiropractic Neurology Board and Master Practitioners of Neuro Linguistics. Rosemary holds a Masters in Chiropractic Paediatrics, and Genevieve is completing her PhD in Early Childhood Development. The event is hosted and organised by the ‘United Chiropractic Association UK’ (UCA), an organisation with a mission to ensure the public has access to vitalistic chiropractic care, which claims that chiropractors provide care that is safe. Because the techniques used by chiropractors are acquired over years of study and experience, chiropractors have an enviable safety record. In fact, in the words of a classic New Zealand study, chiropractic care is “remarkably safe.” Chiropractors use the latest methods. After years of study, licensing examinations and continuing education seminars, chiropractors in the United Kingdom are at the top of their game, using proven techniques and natural methods to help you get well and stay well. The UCA is firmly rooted in the gospel of the founding fathers (D D Palmer, B J Palmer etc. ): Chiropractic is concerned with the preservation and restoration of health, and focuses particular attention on the subluxation. A subluxation is a complex of functional and/or structural and/or pathological articular changes that compromise neural integrity and may influence organ system function and general health. A subluxation is evaluated, diagnosed, and managed through the use of chiropractic procedures based on the best available rational and empirical evidence. Subluxation is a fundamental axiom of the Chiropractic profession. The World Federation of Chiropractors (WFC) policy statement reaffirms the use of the term vertebral subluxation and it is defined succinctly and accepted by the World Health Organisation (WHO). Thus, the UCA seems to subscribe to both principles of the Palmers. The first is subluxation and the second is profit. Now, now, now – I must not be so sarcastic. You are absolutely correct, Edzard. I herewith offer the UCA to give two lectures during their course; one about the importance of critical thinking in healthcare, and one reviewing the evidence for and against chiropractic for paediatric conditions. There seem to be plenty of myths and misunderstandings about homeopathy in India. Homeopathy was first introduced to India by a German doctor from Siebenbuergen, Martin Honigberger (1795 – 1869). He first came to India in 1829 as a conventionally trained physician and treated amongst other personalities the Maharaja Ranjit Singh of Punjab. In 1834, he returned to Europe, met Hahnemann, and became a convert of homeopathy. Subsequently he returned to India, in 1839, and brought homeopathy to this country. Initially, homeopathy was practised mainly by lay practitioners. Mahendra Lal Sircar is said to have been the first Indian who became a homeopathic physician, and he is often called the ‘Hering of India’. The ‘Calcutta Homeopathic Medical College’ was established in 1881 and assumed a crucial role in popularising homeopathy. The government on Tuesday said homeopathy is ‘clinically effective’ and there has been a 50 % rise in the number of patients seeking homeopathic treatment in the country in the past five years. “In India, at 23 Institutes/ Units under the Central Council for Research in Homeopathy (CCRH), there is 50 % more footfall of patients seeking homeopathic treatment during the last five years,” said AYUSH Minister of State (Independent Charge) Shripad Yesso Naik. “Homeopathy is not a pseudoscience. The conclusion of most comprehensive systematic reviews of studies based on classical homeopathy has concluded that it has a positive and specific effect greater than placebo alone,” he said in a written reply in the upper house. “Homeopathy is being promoted as it is not only safe and effective but also due to its high acceptance through high quality surveys of use of homeopathy,” said Naik, adding that there is evidence that homeopathy is beneficial. “There is evidence based data (not anecdotal) with CCRH that warrants the promotion or acceptance of homeopathy in India,” said the Minister. In my view, this foremost begs one question: How does Shripad Yesso Naik get away with evidently false statements? The minister describes himself as a ‘business person’ (not sure what this means, but it clearly does not describe a medical expert). Wikipedia has this interesting information on him: On March 25, 2016, Shripad Naik publicly stated he had access to research which proved that diseases such as cancer could be cured by yoga. He further stated that his Ministry was a year away from granting an endorsement to such techniques and research. The statement was challenged by medical researchers and doctors, who advocated caution in claiming a cure to cancer on the basis of unproven and unpublished research. I do not need to repeat here the evidence on homeopathy (we have dealt with it regularly on this blog); suffice to state that it fails to show that highly diluted homeopathic remedies differ from placebos. This, in turn, means that the accusation of ‘false propaganda’ must be directed not at the sceptics but at the AYUSH-ministry. And what about the claim that homeopathy is currently so hugely popular in India? It seems that it is bogus too. A recent survey conducted by ‘Indian National Sample Survey Office’ revealed that 90% of the Indian population rely on conventional medicine. Merely 6% trust what the investigators chose to call ‘Indian systems of medicine’, e. g. ayurveda, yoga, siddha and homeopathy, often abbreviated as AYUSH. The message that seems to emerge from all this is that, in India, homeopathy is being promoted on the basis of exaggerations and untruths – much like in many other countries, I hasten to add. Chiropractors are fast giving up the vitalistic and obsolete concepts of their founding fathers, we are told over and over again. But are these affirmations true? There are good reasons to be sceptical. Take this recent paper, for instance. The objective of this survey was to investigate the proportion of Australian chiropractic students who hold non-evidence-based beliefs in the first year of study and to determine the extent to which they may be involved in non-musculoskeletal health conditions. Students from two Australian chiropractic programs were invited to answer a questionnaire on how often they would give advice on 5 common health conditions in their future practices, as well as to provide their opinion on whether chiropractic spinal adjustments could prevent or help seven health-related conditions. The response rate of this survey was 53%. Students were highly likely to offer advice on a range of non-musculoskeletal conditions. The proportions were lowest in first year and highest the final year. For instance, 64% of students in year 4/5 believed that spinal adjustments improve the health of infants. Also, high numbers of students held non-evidence-based beliefs about ‘chiropractic spinal adjustments’ which tended to occur in gradually decreasing in numbers in sequential years, except for 5th and final year, when a reversal of the pattern occurred. The authors concluded that new strategies are required for chiropractic educators if they are to produce graduates who understand and deliver evidence-based health care and able to be part of the mainstream health care system. This is an interesting survey, but I think its conclusion is wrong! Educators do not require ‘new strategies’, I would argue; they simply need to take their duty of educating students seriously – educating in this context does not mean brain-washing, it means teaching facts and evidence-based practice. And this is were any concept of true education would run into problems: it would teach students that chiropractic is built on sand. Conclusions need to be based on the data presented. Therefore, the most fitting conclusion, in my view, is that chiropractic students are currently being educated such that, once let loose on the unsuspecting and often all too gullible public, they will be a menace and a serious danger to public health. What are the competencies of a ‘certified paediatric doctor of chiropractic’? But I would be more than willing to change my mind – provided someone can show me good evidence to the contrary. GPs are increasingly dissatisfied with doling out pills that do not work for illnesses with social and emotional roots, and a surprising number of them end up turning to alternative medicine. What a sentence! I would have thought that GPs have always been ‘dissatisfied’ with treatments that are ineffective. But who says they turn to alternative medicine in ‘surprising numbers’ (our own survey does not confirm the notion)? And what is a ‘surprising number’ anyway (zero would be surprising, in my view)? Charlotte Mendes da Costa is unusual in being both an NHS GP and a registered homeopath. Her frustration with the conventional approach of matching a medicine to a symptom is growing as doctors increasingly see the limits, and the risks, of such a tactic. Do we get the impression that THE TIMES does not know that homeopathy is not herbal medicine? Do they know that ‘matching a medicine to a symptom’ is what homeopaths believe they are doing? Real doctors try to find the cause of a symptom and, whenever possible, treat it. She asks patients with sore throats questions that few other GPs pose: “What side is it? Is it easier to swallow solids or liquids? What time of day is it worst?” Dr Mendes da Costa is trying to find out which homeopathic remedy to prescribe. But when NHS guidance for sore throats aims mainly to convince patients that they will get better on their own, her questions are just as important as her prescription. In this case, she should ask her money back; her medical school seems to have been rubbish in training her adequately. This week a Lancet series on back pain said that millions of patients were getting treatments that did them no good. A government review is looking into how one in 11 people has come to be on potentially addictive drugs such as tranquillisers, opioid painkillers and antidepressants. Yes, and how is that an argument for homeopathy? It isn’t! It seems to come from the textbook of fallacies. And this week a BMJ Open study found that GPs with alternative training prescribed a fifth fewer antibiotics. That study was akin to showing that butchers sell less vegetables than green-grocers. It provided no argument at all for implying that homeopathy is a valuable therapy. Doctors seem receptive to alternative approaches: in a poll on its website 70 per cent agreed that doctors should recommend acupuncture to patients in pain. The Faculty of Homeopathy now counts 400 doctors among its 700 healthcare professional members. Wow! Does the Times journalist know that the ‘Faculty of Homeopathy’ is primarily an organisation for doctor homeopaths? If so, why are these figures anything to write home about? And does the author appreciate that the pole was open not just to doctors but to to anyone (particularly those who were motivated, like acupuncturists)? This horrifies many academics, who say that there is almost no evidence that complementary therapies work. It horrifies nobody, I’d say. It puzzles some people, and not just academics. And their claim of a lack of sound evidence is evidence-based. Here comes the inevitable Dr Dixon (the ‘pyromaniac in a field of straw-men’) with the oldest chestnut in town. But repeating a nonsense endlessly does not render it sensible. Dr Dixon says there are enormous areas of illness ranging from chronic pain to irritable bowels where few conventional treatments have been shown to be particularly effective, so why not try alternatives with fewer side effects? Unable to diagnose and treat adequately, let’s all do the next worst thing and apply some outright quackery?!? Logic does not seem to be Dixon’s strong point, does it? He recommends herbal remedies such as pelargonium — “like a geranium, quite a pretty little flower” — acupressure, and techniques such as self-hypnosis. To those who say these are placebos he replies: so what? So what indeed! There are over 200 species of pelargonium; only 2 or 3 of them are used in herbal medicine. I don’t suppose Dr Dixon wants to poison us? It frightens me to know that there are doctors out there who think like this! What if a patient is seriously ill? A cancer is a metaphor for what exactly? As doctors, we have the ethical duty to apply BOTH the science and the art of medicine, BOTH efficacious, evidence-based therapies AND compassion. Can I be so bold as to recommend our book about the ethics of alternative medicine to Dixon? Such talk makes conventional doctors very nervous. Yet acupuncture illustrates their dilemma. It used to be recommended by the NHS for back pain because patients did improve. Now it is not, after further evidence suggested that patients given placebo “sham acupuncture” did just as well. No, acupuncture used to be recommended by NICE because there was some evidence; when subsequently more rigorous trials emerged showing that it does NOT work, NICE stopped recommending it. Real medicine develops – it’s only alternative medicine and its proponents that seem to be stuck in the past and resist progress. Society has long answered it! The answer is called evidence-based medicine. We are not content using quackery for its placebo response; we know that effective treatments do that too, and we want to make progress and improve healthcare of tomorrow. I am sorry, if this post turned into a bit of a lengthy rant. But it was needed, I think: if there ever was a poorly written, ill focussed, badly researched and badly argued article on alternative medicine, it must be this one. Did I call the Times a highly respected paper? The media have (rightly) paid much attention to the three Lancet-articles on low back pain (LBP) which were published this week. LBP is such a common condition that its prevalence alone renders it an important subject for us all. One of the three papers covers the treatment and prevention of LBP. 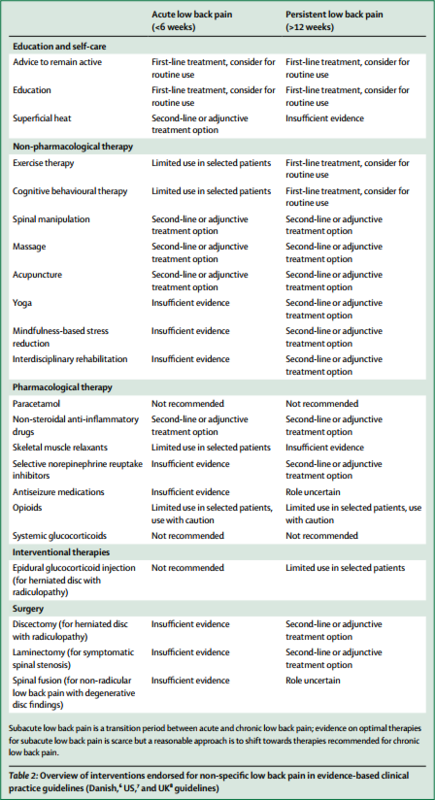 Specifically, it lists various therapies according to their effectiveness for both acute and persistent LBP. The authors of the article base their judgements mainly on published guidelines from Denmark, UK and the US; as these guidelines differ, they attempt a synthesis of the three. The thing is that I am broadly in agreement with the evidence presented in Lancet-paper! But I also know that things are a bit more complex. I imagine that chiropractors, osteopaths and acupuncturists will strongly disagree with my interpretation of the evidence (they might even feel that their cash-flow is endangered) – and I am looking forward to the discussions around their objections. At least this is what the authors of this new study want us to believe. This RCT is entitled ‘Efficacy and tolerability of a complex homeopathic drug in children suffering from dry cough-A double-blind, placebo- controlled, clinical trial’. It recruited children suffering from acute dry cough to assess the efficacy and tolerability of a complex homeopathic remedy in liquid form (Drosera, Coccus cacti, Cuprum Sulfuricum, Ipecacuanha = Monapax syrup, short: verum). According to the authors of the paper, “the primary objective of the trial was to demonstrate the superiority of verum compared to the placebo”. A total of 89 children, enrolled in the Ukraine between 15/04/2008 and 26/05/2008 in 9 trial centres, received verum and 91 received placebo daily for 7 days (age groups 0.5–3, 4–7 and 8–12 years). The trial was conducted using an adaptive 3-stage group sequential design with possible sample size adjustments after the two planned interim analyses. The inverse normal method of combining the p-values from all three stages was used for confirmatory hypothesis testing at the interim analyses as well as at the final analysis. The primary efficacy variable was the improvement of the Cough Assessment Score. Tolerability and compliance were also assessed. A confirmatory statistical analysis was performed for the primary efficacy variable and a descriptive analysis for the secondary parameters. A total of 180 patients (89 in the verum and 91 in the placebo group) evaluable according to the intention-to-treat principle were included in the trial. The Cough Assessment Score showed an improvement of 5.2 ± 2.6 points for children treated with verum and 3.2 ± 2.6 points in the placebo group (p < 0.0001). The difference of the least square means of the improvements was 1.9 ± 0.4. The effect size of Cohen´s d was d = 0.77. In all secondary parameters the patients in the verum group showed higher rates of improvement and remission than those in the placebo group. In 15 patients (verum: n = 6; placebo: n = 9) 18 adverse drug reactions of mild or moderate intensity were observed. The authors concluded that the administering verum resulted in a statistically significantly greater improvement of the Cough Assessment Score than the placebo. The tolerability was good and not inferior to that of the placebo. This study seems fairly rigorous. What is more, it has been published in a mainstream journal of reasonably high standing. So, how can its results be positive? We all know that homeopathy does not work, don’t we? Are highly diluted homeopathic remedies effective after all? It was conducted 10 years ago; why did it take that long to get it published? I don’t think highly of a study with “the primary objective … to demonstrate the superiority” of the experimental interventions. Scientists use RCTs for testing efficacy and pseudo-scientist use it for demonstrating it, I think. The study was conducted in the Ukraine in 9 centres, yet no Ukrainian is an author of the paper, and there is not even an acknowledgement of these primary investigators. The ‘adaptive 3-stage group sequential design with possible sample size adjustments’ sounds very odd to me, but I may be wrong; I am not a statistician. We learn that 180 patients were evaluated, but not how many were entered into the trial? The Cough Assessment Score is not a validated outcome measure. Was the verum distinguishable from the placebo? It would be easy to test whether the patients/parents were truly blinded. Yet no such results were included. The trial was funded by the manufacturer of the homeopathic remedy. The paper has three authors 1)Hans W. Voß has no conflict of interest to declare. 2) Rainer Brünjes is employed at Cassella-med, the marketing authorisation holder of the study product. 3) Andreas Michalsen has consulted for Cassella-med and participated in advisory boards. I know, homeopathy fans will think I am nit-picking; and perhaps they are correct. So, let me tell you why I really do strongly reject the notion that this study shows or even suggests that highly diluted homeopathic remedies are more than placebos. The remedy used in this study is composed of Drosera 0,02 g, Hedera helix Ø 0,04 g, China D1 0,02 g, Coccus cacti D1 0,04 g, Cuprum sulfuricum D4 2,0 g, Ipecacuanha D4 2,0 g, Hyoscyamus D4 2,0 g.
In case you don’t know what ‘Ø’ stands for (I don’t blame you, hardly anyone outside the world of homeopathy does), it signifies a ‘mother tincture’, i. e. an undiluted herbal extract; and ‘D1’ signifies diluted 1:10. This means that the remedy may be homeopathic from a regulatory point of view, but for all intents and purposes it is a herbal medicine. It contains an uncounted amount of active compounds, and it is therefore hardly surprising that it might have pharmacological effects. In turn, this means that this trial does by no means overturn the fact that highly diluted homeopathic remedies are pure placebos. It’s a pity, I find, that the authors of the paper fail to explain this simple fact in full detail – might one think that they intentionally aimed at misleading us? Almost everyone will have low back pain at some point in their lives. It can affect anyone at any age, and it is increasing—disability due to back pain has risen by more than 50% since 1990. Low back pain is becoming more prevalent in low-income and middle-income countries (LMICs) much more rapidly than in high-income countries. The cause is not always clear, apart from in people with, for example, malignant disease, spinal malformations, or spinal injury. Treatment varies widely around the world, from bed rest, mainly in LMICs, to surgery and the use of dangerous drugs such as opioids, usually in high-income countries. The Lancet publishes three papers on low back pain, by an international group of authors led by Prof Rachelle Buchbinder, Monash University, Melbourne, Australia, which address the issues around the disorder and call for worldwide recognition of the disability associated with the disorder and the removal of harmful practices. In the first paper, Jan Hartvigsen, Mark Hancock, and colleagues draw our attention to the complexity of the condition and the contributors to it, such as psychological, social, and biophysical factors, and especially to the problems faced by LMICs. In the second paper, Nadine Foster, Christopher Maher, and their colleagues outline recommendations for treatment and the scarcity of research into prevention of low back pain. The last paper is a call for action by Rachelle Buchbinder and her colleagues. They say that persistence of disability associated with low back pain needs to be recognised and that it cannot be separated from social and economic factors and personal and cultural beliefs about back pain. In this situation, it makes sense, I think, to opt for a treatment (amongst similarly effective/ineffective therapies) that is at least safe, cheap and readily available. This automatically rules out chiropractic, osteopathy and many others. Exercise, however, does come to mind – but what type of exercise? The aim of this meta-analysis of randomized controlled trials was to gain insight into the effectiveness of walking intervention on pain, disability, and quality of life in patients with chronic low back pain (LBP) at post intervention and follow ups. Six electronic databases (PubMed, Science Direct, Web of Science, Scopus, PEDro and The Cochrane library) were searched from 1980 to October 2017. Randomized controlled trials (RCTs) in patients with chronic LBP were included, if they compared the effects of walking intervention to non-pharmacological interventions. Pain, disability, and quality of life were the primary health outcomes. Nine RCTs were suitable for meta-analysis. Data was analysed according to the duration of follow-up (short-term, < 3 months; intermediate-term, between 3 and 12 months; long-term, > 12 months). Low- to moderate-quality evidence suggests that walking intervention in patients with chronic LBP was as effective as other non-pharmacological interventions on pain and disability reduction in both short- and intermediate-term follow ups. The authors concluded that, unless supplementary high-quality studies provide different evidence, walking, which is easy to perform and highly accessible, can be recommended in the management of chronic LBP to reduce pain and disability. I know – this will hardly please the legions of therapists who earn their daily bread with pretending their therapy is the best for LBP. But healthcare is clearly not about the welfare of the therapists, it is/should be about patients. And patients should surely welcome this evidence. I know, walking is not always easy for people with severe LBP, but it seems effective and it is safe, free and available to everyone. My advice to patients is therefore to walk (slowly and cautiously) to the office of their preferred therapist, have a little rest there (say hello to the staff perhaps) and then walk straight back home. Professor Frass has repeatedly stated that his published criticism of the Lancet meta-analysis has never been refuted, and therefore homeopathy is a valid therapy. The last time we heard him say this was during a TV discussion (March 2018) where he said that, if one succeeded in scientifically refuting the arguments set out in his paper, one would show the ineffectiveness of homeopathy. Even with careful selection, it remains problematic to compare studies of a pool of 165 for homeopathy vs 4200,000 for conventional medicine. This factor of 41000 already contains asymmetry. We see no good reasons why the asymmetry poses a problem; it does not conceivably impact on the outcome, nor does it bias the results. In fact, such asymmetries are common is research. Furthermore, it appears that there is discrimination when publications in English (94/110, 85% in the conventional medicine group vs 58/110, 53% in the homeopathy group) are rated higher quality (Table 2). We cannot confirm that the table demonstrates such a discrimination, nor do we understand how this would disadvantage homeopathy. Neither the Summary nor the Introduction clearly specify the aim of the study. The authors stated that they “analysed trials of homoeopathy and conventional medicine and estimated treatment effects in trials least likely to be affected by bias”. It is hardly difficult to transform this into their aim: the authors aimed at analysing trials of homoeopathy and conventional medicine and estimating treatment effects in trials least likely to be affected by bias. Furthermore, the design of the study differs substantially from the ﬁnal analysis and therefore the prolonged description of how the papers and databases were selected is misleading: instead of analysing all 110 studies retrieved by their deﬁned inclusion and exclusion criteria, the authors reduce the number of investigated studies to ‘larger trials of higher quality’. By using these sub-samples, the results seem to differ between conventional medicine and homeopathy. This statement discloses a misconception of the approach used in the meta-analysis. The meta-analysis of all 110 trials found some advantages of homeopathy. When the authors performed a sensitivity analysis with high quality and larger studies, this advantage disappeared. The sensitivity analysis was to determine whether the overall treatment effect seen in the initial analysis was real or false-positive. In the case of homeopathy, it turned out to be false (and presumably for this reason, the authors hardly mention it in their paper), whereas for the trials of conventional medicines, it was real. This procedure is in keeping with the authors’ stated aims. The meta-analysis does not compare studies of homeopathy vs studies of conventional medicine, but speciﬁc effects of these two methods in separate analyses. Therefore, a direct comparison must not be made from this study. We fail to see the significance in terms of the research question stated by the authors. Even Frass et al use direct comparisons above. However, there remains great uncertainty about the selection of the eight homeopathy and the six conventional medicine studies: the cut-off point seems to be arbitrarily chosen: if one looks at Figure 2, the data look very much the same for both groups. This holds true even if various levels of SE are considered. Therefore, the selection of larger trials of higher quality is a post-festum hypothesis but not a pre-set criterion. This is not true, Shang et al clearly stated in their paper: “Trials with SE (standard error) in the lowest quartile were considered larger trials.” It is common, reasonable and in keeping with the authors’ aims to conduct sensitivity analyses using a subset of trials that seem more reliable than the average. The question remains: was the restriction to larger trials of higher quality part of the original protocol or was this a data-driven decision? Since we cannot ﬁnd this proposed reduction in the abstract, we doubt that it was included a priori. We are puzzled by this statement and fail to understand why Frass et al insist that this information should have been in the abstract. However, even if one assumes that this was a predeﬁned selection, there are still some problems with the authors’ interpretation: for larger trials of higher reported methodological quality, the odds ratio was 0.88 (CI 95%: 0.65–1.19) based on eight trials of homeopathy: although this ﬁnding does not prove an effect of the study design on the 5% level, neither does it disprove the hypothesis that the results might have been achieved by homeopathy. For conventional medicine, the odds ratio was 0.58 (CI 95% 0.39–0.85), which indicates that the results may not be explained by mere chance with a 5% uncertainty. As the outcome failed to reach the level of significance, the null-hypothesis (“there is no difference”) cannot be discarded, and this is sufficient evidence to show that there is no evidence for the effectiveness of homeopathy. The comment by Frass et al seems to be based on a misunderstanding how science operates. Although the authors acknowledge that ‘to prove a negative is impossible’ the authors clearly favour the view that there is evidence that homoeopathy exhibits no effect beyond the placebo-effect. However, this conclusion was drawn after a substantial modiﬁcation of the original protocol which considerably weakens its validity from the methodological point of view. After acquiring the trials by their original inclusion- and exclusion criteria they introduced a further criterion, ‘larger trials of higher reported methodological quality’. Thus, eight trials (=46% of the larger trials) in the homoeopathy group were left and only six (32%) in conventional medicine group (an odds ratio of 0.75 in favour of homoeopathy). As explained above, the authors’ reasoning was clear and rational; it did not follow the logic suggested by Frass et al. which confirms our suspicion already mentioned above that Frass et al misunderstood the concept of the Shang meta-analysis. But the decisive point is that it is unlikely that these six trials are still matched to the eight samples of homoeopathy (although each of the 110 in the original was matched). Consequently, one cannot conclude that these trials are still comparable. Thus, any comparisons of results between them are unjustiﬁed. Further evidence that Frass et al misunderstood the concept of the Shang meta-analysis. The rationale for this major alteration of the study protocol was the assumption, that these larger, higher quality trials are not biased, but no evidence or databased justiﬁcation is given. Neither the actual data (odds ratio, matching parameters…) nor a funnel plot (to indicate that there is no bias) of the ﬁnal 14 trials are supplied although these parameters constitute the ground of their conclusion. The other 206 trials (94% of the originally selected according to the protocol) were discarded because of possible publication biases as visualized by the funnel plots. However, the use of funnel plots is also questionable. Funnel plots are thought to detect publication bias, and heterogeneity to detect fundamental differences between studies. New evidence suggests that both of these common beliefs are badly ﬂawed. Using 198 published meta-analyses, Tang and Liu demonstrate that the shape of a funnel plot is largely determined by the arbitrary choice of the method to construct the plot. When a different deﬁnition of precision and/or effect measure was used, the conclusion about the shape of the plot was altered in 37 (86%) of the 43 meta-analyses with an asymmetrical plot suggesting selection bias. In the absence of a consensus on how the plot should be constructed, asymmetrical funnel plots should be interpreted cautiously. These ﬁndings also suggest that the discrepancies between large trials and corresponding meta-analyses and heterogeneity in metaanalyses may also be determined by how they are evaluated. Researchers tend to read asymmetric funnel plots as evidence of publication bias, even though metaanalyses without publication bias frequently have asymmetric plots and meta-analysis with publication bias frequently have symmetric plots, simply due to chance. Perhaps we should mention that the senior author of the Lancet meta-analysis, Mathias Egger, is the clinical epidemiologist who invented the funnel plot and certainly knows how to use and interpret it. Use of funnel plots is even more unreliable when there is heterogeneity. Apart from the questionable selection of the samples there is a further aspect of randomness which further weakens their conclusion: the odds ratio of the eight trials of homoeopathy was 0.88 (CI 0.65–1.19), which might be signiﬁcant around the 7–8% level. Actually, the reader might be interested to know at which exact level homeopathy would have become signiﬁcant. Thus, there is no support of their conclusion any more when you shift the level of signiﬁcance by mere, say 2–3%. What number of grains is required to build a heap? Certainly there is such a limit. Five grains are not a heap, five billion are. But if you select any specific value, you will find it hard to explain if one grain less changes the characteristic of a heap to become a number of grains only. Same here. If p = 0.05 is the limit of significance, p = 0.05001 is not significant, let alone, when p is 2-3%higher than that. In addition, with such controversial hypotheses the scientiﬁc community would tend to use a level of signiﬁcance of 1% in which case the odds ratio of the conventional studies would not be signiﬁcant either. The level of 5% is commonly applied in medical research; it is the accepted standard. Frass et al also apply it in their studies; but here they want to change it. Why, to suit their preconceived ideas? From a statistical point of view, the power of the test, considering the small sample sizes, should have been stated, especially in the case of a nonsigniﬁcant result. This might have been informative but is rarely done in meta-analyses. Above all, the choice of which trials are to be evaluated is crucial. By choosing a different sample of eight trials (eg the eight trials in ‘acute infections of the upper respiratory tract’, as mentioned in the Discussion section) a radically different conclusion would have had to be drawn (namely a substantial beneﬁcial effect of homeopathy—as the authors state). The authors may not be aware that larger trials are usually not ‘classical’ homeopathic interventions, because the main principle of homeopathy, individualization are difﬁcult to apply in large trials. In this respect, the whole study lacks sound understanding of what homeopathy really is. This is a red herring; firstly the authors did not aim to evaluate individualised homeopathy. Secondly, Frass et al know very well that clinical homeopathy is not individualised and regarded as entirely legitimate by homeopaths. And finally, the largest trial of individualised homeopathy included in Mathie’s review of individualized homeopathy had 251 participants. So, why has so far no rebuttal of this ‘letter to the Editor’ been published? We suspect that the journal Homeopathy has little incentive to publish a critical response, and critics of homeopathy have even less motivation to submit one to this journal. Other journals have no reason at all to pursue a discussion started in ‘Homeopathy’. In other words, Frass et al were safe from any rebuttal – until today, that is.